Staniar Gallery Features Borderland Collective Artists The show will be on view through Dec. 8. Staniar Gallery at Washington and Lee University is featuring “Northern Triangle,” an exhibition that examines issues around migration and human rights in the context of the Central American countries of El Salvador Guatemala and Honduras. The show will be on view from Nov. 6 through Dec. 8. 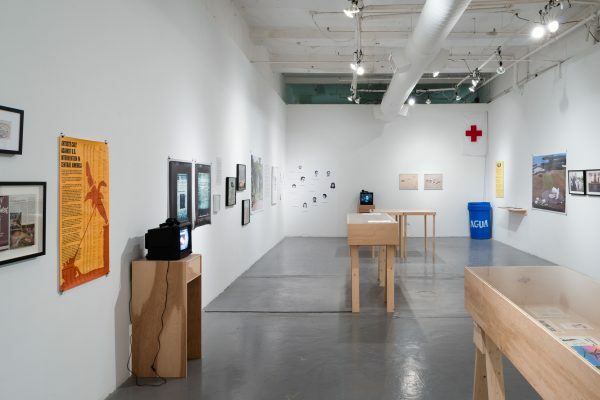 Originally commissioned by Blue Star Contemporary in Texas, this installation created by Borderland Collective uses photographs, maps, art objects, personal stories and political documents to foster constructive dialogue and exchange around the current Central American-refugee crisis along the U.S./Mexico border. Borderland Collective, led by artists Jason Reed and Mark Menjivar and art historian Erina Duganne, is a long-term art and education project that utilizes collaboration between artists, educators, youth and community members to engage in complex issues and build space for diverse perspectives through meaningful dialogue and modes of creation and reflection. Reed is co-founder and director of Borderland Collective and associate professor of photography at Texas State University. He has created gallery and public space exhibitions of collaborative work across the United States. His individual work has been exhibited around the world, including Co-Lab Gallery in Austin; Texas Vanderbilt University in Nashville, Tennessee; and Galerie Reinthaler in Austria. Reed holds a B.A. in geography from the University of Texas and an M.F.A. in photography from Illinois State University. Menjivar is an artist and photographer based in San Antonio, Texas. His work has been included in multiple exhibitions, including at The Houston Center for Photography and The San Antonio Museum of Art. He earned his B.A. in social work at Baylor University and his M.F.A. in art and social practice at Portland State University. Staniar Gallery is located on the second floor of Wilson Hall, in Washington and Lee University’s Lenfest Center for the Arts. Gallery hours are Monday through Friday, 9 a.m. to 5 p.m. For more information call 540 458-8861.